KEGG Translator (KT) failed to capture relationship between the entities and so no reactions are seen in the converted model. The hsa05221 (right) KEGG pathway (KGML format) from KEGG pathway database was converted using KT and then the output SBML file was opened in cellDesigner. KT was able to successfully capture entity names from KGML and generate SBML. But as can be noticed in the converted diagram there are several missing information: 1) relationships between the molecules are totally lost and no reaction with types are present; 2) entity types are not inferred from the information provided by KGML; and 3) modification and state information for the molecules are not captured. Figure 2: KcPAVS KGML/KEGG-XML converter captures the relationships and pathway attributes more accurately. Notice in the diagram where same pathway as above (hsa05221) was converted using KcPAVS KGML Converter. Notice that converted diagram matches the original KEGG pathway closer semantically. KcPAVS-KGML converter provides most accurate converted formats (Cell Designer, BioPAX, Xgmml and SIF) that closely matches the original KGML semantically. Internally KcPAVS converter uses KT and in addition has implemented rules to capture the semantics of KGML pathways more accurately. KcPAVS-KGML converter is successful in extracting and converting all the pathway information (interactions and assigning interaction types like state transition, transcription, complex assembly, inhibition, catalysis; inferred entity types based on its participation in the interactions; and captured molecule state and modifications like phosphorylation) . For example, KcPAVS converter implements a rule to infer entity types looking at the information provided by an interaction (<relation>) in KGML. For transcription interaction one can deduce that the reactant as gene, product as transcribed RNA and the modifier to be a transcription factor (if an entity modulating is a protein). NOTE:The dangling entities and broken network are due to defect in the KGML files. We have noticed several inconsistencies between KEGG pathway image representation and how it is represented in KGML files. Sometimes even the information about an interaction is wrong or is totally absent. Some of such data problems could not be automatically rectified and is imported as it is into our database. 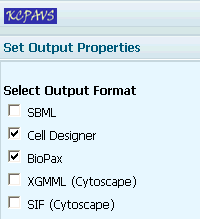 Figure 4: The KEGG pathway ( hsa00010, Glycolysis / Gluconeogenesis - Homo sapiens ) was converted into CellDesigner files (A) and then converted into BioPAX file (B) using KcPAVS Converter . The converted BioPAX files were imported into Cytoscape along with BiNOM CellDesigner Visual style sheets applied to render the below figure. Choose the pathways and for which organisms that you want to convert. Alternatively upload the KGML files using upload wizard. Download / visualize the converted files.